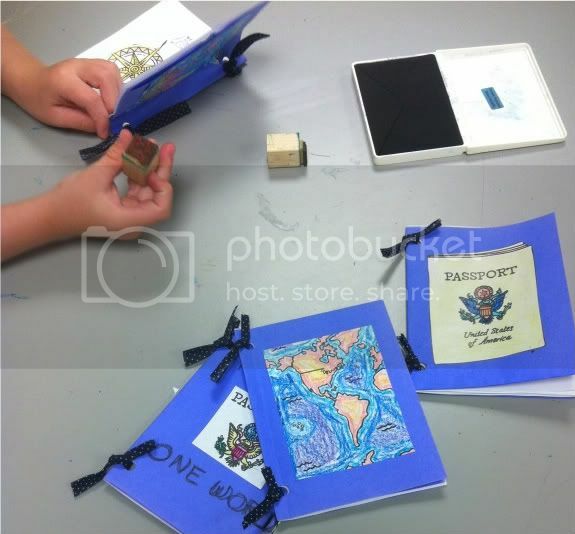 I had fun creating this passport themed craft for our summer reading program. The kids really enjoyed it. I made photocopies from one of the pages of clip art included in our Collaborative Summer Reading Program binder to use as inspiration images on the covers. The cover is simply blue paper folded in quarters. Most of the kids needed help with the hole-puncher - luckily I had plenty of parents and teen volunteers to help me out in that regard. I suppose yarn would have been easier to tie, but I had this ribbon left-over, so decided to use that up. For an added touch of authenticity, I printed up some pages for the middle of the passports with watermarked graphics from the summer reading theme of "One World, Many Stories" -- I was able to use the few pages I had left over as scrap paper for the library. I encouraged participants to get creative and design the cover of their passports however they liked. To finish up, we brought out some stamps and stamped the passports to represent all the countries we'd like to go to one day. Thanks for the inspiration! I want to use this idea for our personal reading time at home this summer. Once my son is done reading a book I hope to encourage him to journal a short sentence (both in french and english) once he is done that I will stamp it. I know he will be just as inspired as I am!